Opposite the Cullinan II diamond, on the back of the Imperial State Crown, the Stuart Sapphire rests beneath a cross pattee. This beautiful 1.5- by 1-inch brilliant blue oval gemstone hails from the famed Stuart Monarchy of England and Scotland. The Stuarts reigned uncontested, under James I, from 1603 to 1649, under Charles I.
James I was the Protestant of Protestants. His conviction that he was above the law, answerable to God alone, led him to make some radical decisions that had resounding effects that ripple into today. Under his rule, Puritan reformers were dismissed and Catholics were forbidden from attending Mass. He also introduced Protestants to Northern Ireland. He did attempt to maintain peace between England and the other European countries, but he was not favored by Parliament and his decisions left the country in debt at his death. He was succeeded by his son, Charles I, who swiftly persuaded Parliament to grant him finances to go to war with Spain and France. By 1629, King Charles I had completely lost favor with the ruling class. Believing, as his father did, that he was above the law, he dismissed Parliament and ruled England as a pure monarchy until he was forced to recall Parliament in 1639. Ten years later, after inciting a Civil War in England, his rule was overthrown and he was executed. It is here where the Stuart Sapphire’s unique story unfolds. As a result of this Civil War and the execution of the reigning monarch, a new republic rose in an attempt to overthrow the monarchy. With enough civil unrest, Oliver Cromwell rose to defend the new republic. Desperately in need of money, he dispatched with nearly the entire crown treasury. He sold most of the gemstones and melted all the gold so he could sell it to the highest bidder. However, somehow the Stuart Sapphire narrowly escaped this assault on England’s prized possessions. Rumor has it that Charles II secreted it away when he was exiled to France. After Oliver Cromwell’s death in 1648, two years of anarchy presided over the British Isles until Parliament reestablished its rule. Their first order of business was to invite Charles II to return from his exile in France to reign as King. The Stuarts were back on the throne, and Charles II had the Stuart Sapphire mounted into his crown. In 1685, Charles II’s death left the throne open for his brother, James II. It is unclear exactly what James II did with the sapphire, but it was removed from the crown and stashed somewhere for a few years. Despite his conversion to Roman Catholocism, James II somehow managed to hold the Crown for three years before his position was finally recalled by Parliament. He departed for France in 1688 with the Stuart Sapphire in tow, quite possibly hidden in one of his pockets. 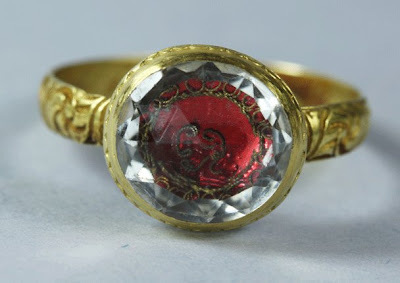 Upon his death in 1701, the gem passed to his son, Charles Edward, who in turn gave it to his son, Henry Benedict Stuart, the Cardinal of York. The Stuart's hapless reign ended with the death of Queen Anne in 1714, after which the Hanovers took the throne of England with the ascension of George I. For nearly 100 years, the sapphire remained in France, until the Cardinal of York died in 1807. Upon his death, the Prince of Wales, George IV, dispatched Angioli Bonelli to collect from France any remaining records relating to the Stuart household. Though her historical account of the life of Princess Charlotte is thorough and entertaining, Ms. Jones’ book may not serve as an entirely credible account. However, according to her, the gemstone remained in the Countesses’ possession until her death in 1861, at which time it was returned to the Crown. In 1837, the Stuart Sapphire was mounted in the front of the band of the Imperial State Crown below the Black Prince’s Ruby, for Queen Victoria’s coronation. However, when the Imperial Crown was remade in 1937, the Cullinan II displaced the Sapphire to its current position directly opposite the Cullinan II on the backside of the crown. 1. Famous Diamonds. "The Stuart Sapphire." Accessed June 11, 2012. http://famousdiamonds.tripod.com/stuartsapphire.html. 2. Internet Stones. "Stuart Sapphire." Accessed June 11, 2012. http://jewelry-blog.internetstones.com/famous-gemstones/stuart-sapphire. 3. History on the Net. "The Stuart Monarchs-1603-1714." Accessed June 11, 2012. http://www.historyonthenet.com/Stuarts/stuart_monarchs.htm. 4. Royal Collection, The. "The Imperial State Crown." Accessed June 11, 2012. http://www.royalcollection.org.uk/collection/31701/the-imperial-state-crown. 5. Younghusband, George John. The Jewel House. London: Herbert Jenkins Limited, 1921. 6. Jones, C. Rachel. 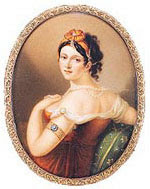 The Princess Charlotte of Wales. London: Wyman & Sons, 1885.